Another day, another roasted veggie recipe! It really does make things easier with a little one around. Once everything is in the pan, I can just toss it in the oven and forget about it for the next 25 minutes - no stirring, mixing, or flipping required! Plus I can roast more than I need and reheat throughout the week when I'm feeling tired and not at all like cooking. Honestly, I'm always surprised by how good it turns out as well. I don't have to do a dang thing to it, and there it is all steamy and aromatic, caramelized bits hiding on the bottom, and veggies that just want to melt in your mouth. Plus there are just about a million different flavor combos you can throw together. This time I opted for a Greek twist with the feta, red onion, and oregano. I paired it with orzo, which I've never actually made before (I know that seems unbelievable considering how much I love pasta) and topped it with a little extra feta. As we say in my house, "it's always betta with feta." Or, in this case, "it's always betta with extra feta." Start by preheating your oven to 425 degrees F. While the oven is preheating, get your pasta water started and cut up your veggies. Your pasta water will probably start to boil well before your veggies are done, so just keep the water warm so it will be ready to go when it's time to put the pasta in. Next, line a dark roasting pan with parchment paper, toss all of your ingredients in (minus the pasta), and spread out evenly. Roast for 18-25 min, or until cooked through and browning on the bottom. 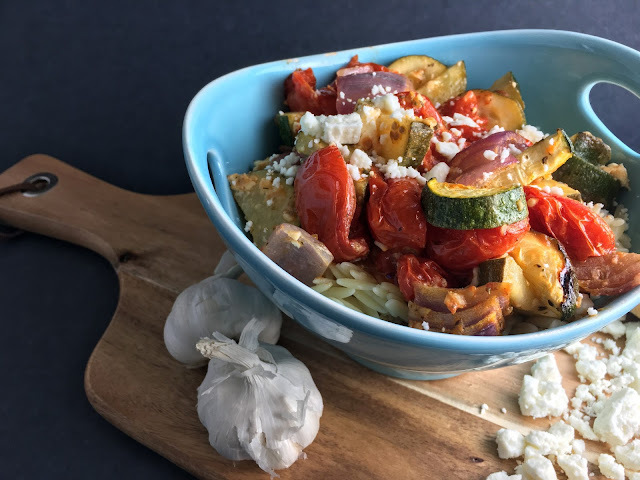 The orzo should take about 9 min to cook, so toss that in about 9 min before your veggies are done and cook according to package directions. 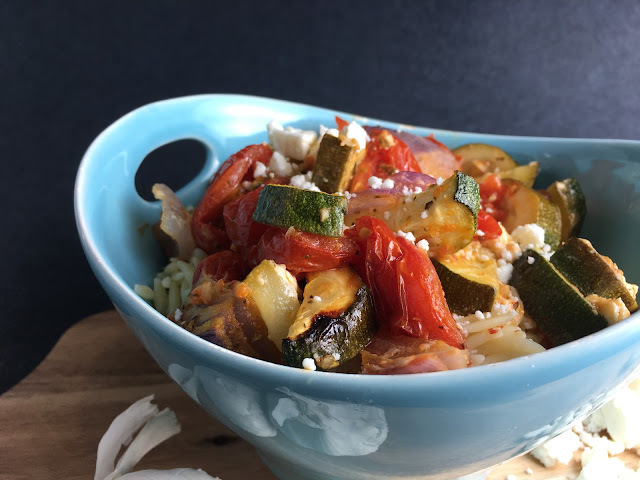 Drain and top with your roasted veggies and a little extra feta. Yum! I also think this would be really good as a cold dish the next day.